This month, my Photo Challenge is on the subject of Leading Lines. I don’t know if you have ever found this, but sometimes when I take a photo and then look back at it, I feel that something is wrong with it. It can have the composition I wanted, but somehow to take it in, my eyes are focusing in a disjointed, zig-zag sort of way, which usually results in said image being deleted. 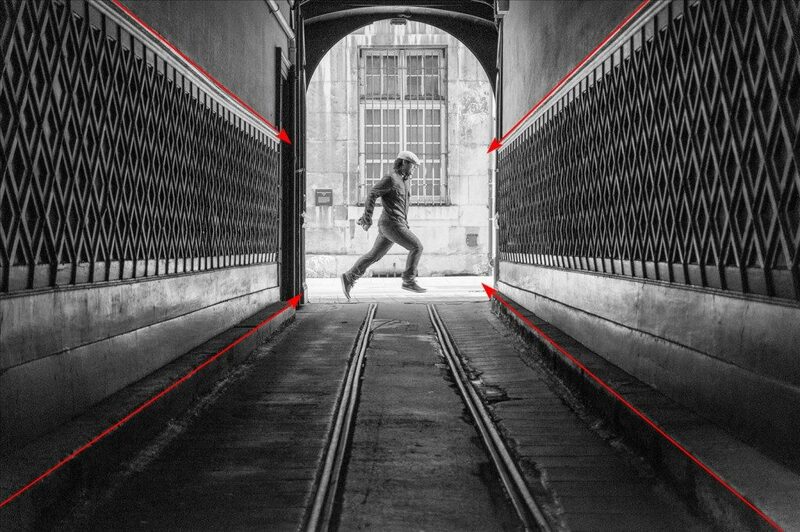 This is where ‘leading lines’ can be used – but what are they? So, before reading Ruth’s Hints and Tips on the subject, my understanding is that they are lines that draw the eye to an object of focus in an image. They can be man-made, such as walls, or masts or they can be naturally-occurring like trees, or waves. So, for this challenge, I have found some photographs that I have taken over the years, that to me, are good examples of the use of leading lines. And I’ve tried to find examples of both man-made and natural leading lines. Here they are – see what you think! In this first image, we have tall trees, all straight and pointing upwards, leading the eye up towards the sun, shining through the treetops. Secondly, we have fences and gates and electricity pylons, all lying parallel to each other, with a hill in the background as the focal point. This time, a bridge! The lines of the bridge and it’s shadow, the edge of the pavement and the double yellow lines all lead the eye to the lady in red, then the church in the background. The branches of this tree – I think it’s a Dragon Tree – are fascinating! They lead the eye to the leaves and fruit which are balanced on the end of each branch. A railway line has to be a leading line gift, especially when there is a steam train at the focal point! The railway lines are supported by a yellow line that has been painted as a safety margin, to the right, and you can vaguely see lines in the pavement, also leading the eye up to the train and hills beyond. This is an Agapanthus plant, taken from inside. The plant stalks are leading upwards, to the flowers. A path through tall trees, with sunlight casting yet more leading lines in the form of shadows – this is one of my favourites! Over to Ruth now for her feedback and she will choose one of the image that she thinks can be improved on. I’m off to read her hints and tips, which you can find here. It’s important ro remember that if you want the attention to be a certain part of the frame, look for lines which already exist, that you can use to your advantage. Whilst leading lines don’t need to be straight, winding paths or roads, spiraling staircases and the logarithmic spiral patterns in plant growth make fantastic leading lines it is important to remember not to overcomplicate things. I’d really love to see you try some of these shots again but this time around i’d like to see you move about the location a bit more, it’s easy to get excited about finding powerful leading lines, but if they’re not pointing exactly where you want them to, they’re doing more harm than good. 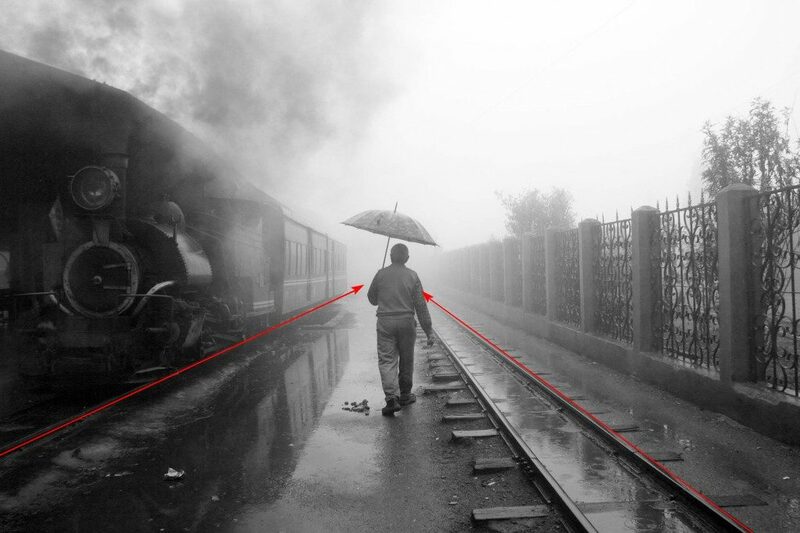 Take a quick look at these examples of leading lines that really work to lead your eye through the picture or to key features. © Mitra Dipanjan, A Walk in the Rain. Thanks Ruth, that’s really opened my eyes to how leading lines work and I love these two examples, they make it so much clearer. With these in mind, I went out and about and tried to find some good examples of leading lines. In my little town, I discovered a few objects and man-made leading lines which worked perfectly. The only problem, as you will see, was that there was very little for the lines to lead your eye to. So please bear with me and try to imagine something wonderful in the distance, at the end of each leading line! Beginning at the top left, the pontoon is being used to draw the eye from bottom left, to the centre of the image. There’s not much at the end, but a cheeky seagull is perched on top of one of the posts! Top right – this image works best as a portrait image, but it’s the road, in a ‘v’ formation that leads the eye to the tree and flowers in the top left of the image. From there, the ye is swept round to the right – with a little blue ‘one-way’ sign to help, and the ornate, old-fashioned street lamp is where the eye stops. 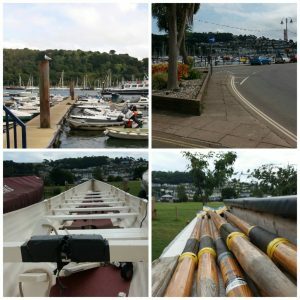 Bottom left – the white boat is the perfect shape to use as a leading line, in this case it leads to some trees and houses, but imagine if it lead to an old tea clipper on the river, or one of the tall ships? Sadly, there were none of these on the river when I went out! Lastly, bottom right and we have some beautiful, aged wooden oars. They lead the eye, in this case, to the centre of the image, where there is a tree – not a very special tree, I admit, but a tree! If there had been something eye-catching in the vicinity, I could have taken this picture from a different angle and the oars would have still worked as leading lines – as Ruth said in her tutorial, leading lines can be to and from any direction, and will even work in a curve. I’ve learned so much more about leading lines – and I thought I knew quite a bit already! I hope you’ve enjoyed taking this journey into leading lines with me. 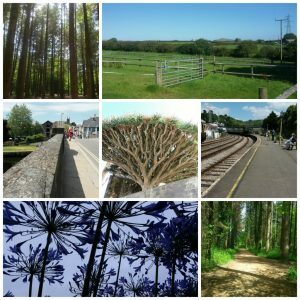 I’m very much looking forward to my next photo challenge – whatever it will be!